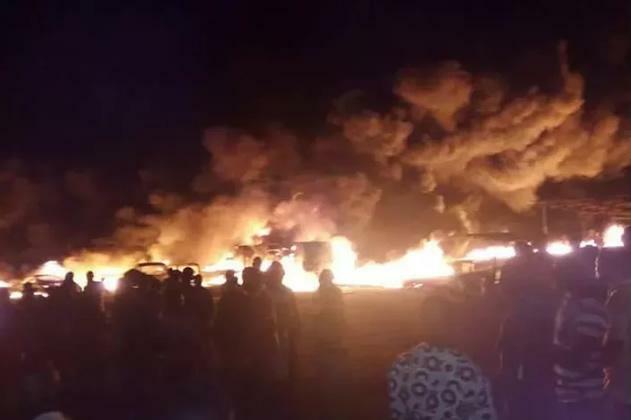 No fewer than seven persons were on Sunday morning confirmed dead in a tanker fire accident that occurred near the Anambra State Governor’s Lodge in Amawbia, near Awka, the state capital. A source told our correspondent that the governor, Willie Obiano, was at the lodge when the incident occurred. The security post of the Governor’s lodge was torched. Scores of persons sustained varying degrees of injury in the accident while several cars, houses and shops were also gutted by the fire. The incident occurred at about 8.40pm on Saturday. An eyewitness told our correspondent that the tanker was negotiating a bend at the Amawbia roundabout when it fell and burst into fire. ” Several other wounded people were loaded in a truck to nearby hospitals”, the source stated. The Police Public Relations Officer in the state, Haruna Mohammed confirmed the incident. He said,” So far, a total number of seven corpses were certified dead at various hospitals by medical doctors while the only surviving victim was referred to the University Teaching hospital Nnewi and was admitted at the intensive care unit of the hospital. “Consequently, out of the seven corpses confirmed dead, three are deposited at Amaku General Hospital Morgue, two at Regina Caeli Hospital and another two at Piston Hospital Morgue for postmortem examination.